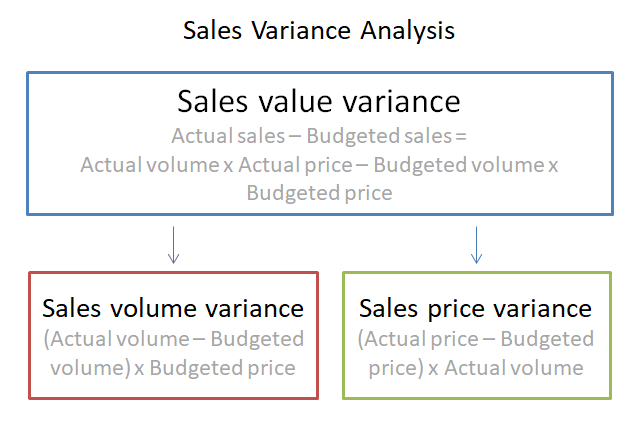 Sales variance analysis is used by managers for identifying and understanding the reasons why the actual sales performance of a business differs from its original budgeted sales. The sales variance sometimes referred to as the sales value variance is the difference between the actual sales and the budgeted sales of the business. The variance is calculated using the total sales variance formula. If actual sales are greater than budgeted sales the formula gives a positive result and the sales variance is referred to as a favorable sales variance. If actual sales are lower than budgeted sales the formula will give a negative result and the sales variance is said to be unfavorable. The total sales variance can be split into two main components. The sales value variance is equal to the sum of the sales volume variance and the sales price variance. The sales volume variance results from the actual volume of sales being different from the budgeted volume of sales. The variance is calculated by taking the difference between the actual sales volume and the budgeted sales volume and multiplying this by the budgeted price to give a monetary amount. The sales volume variance formula is as follows. It should be noted that the term standard is also used when referring to unit prices, so budgeted price in the above formula could be replaced with the term standard price. If actual volume is greater than budgeted volume the sales volume formula gives a positive result and the sales volume variance is a favorable variance. If actual volume is lower than budgeted volume the formula will give a negative result and the sales volume variance is said to be unfavorable. The sales price variance results from the actual price of a sales unit being different from the budgeted (or standard) price. The variance is calculated by taking the difference between the actual price and the budgeted price and multiplying this by the actual sales volume to give a monetary amount. The sales price variance formula is as follows. Again the term standard price could be used instead of budgeted price in the formula above. If the actual price is greater than the budgeted price the formula gives a positive result and the sales price variance is a favorable variance. If the actual price is lower than the budgeted price the formula will give a negative result and the sales price variance is said to be unfavorable. The sales volume variance is calculated as follows. The sales volume variance formula shows that the variance is negative and therefore an unfavorable variance. The actual volume (13,500) is less than the budgeted volume (15,000) by 1,500 units. When multiplied by the budgeted price (4.80) the sales volume variance is determined as -7,200. The sales price variance is calculated as follows. The sales price variance formula shows that the variance is positive and therefore a favorable variance. The actual price (5.50) is greater than the budgeted price (4.80) by 0.70 per unit. When multiplied by the actual volume 13,500 the sales price variance is determined as 9,450. The total sales variance or sales value variance is calculated as follows. Sales variance = Actual volume x Actual price - Budgeted volume x Budgeted price. The sales variance formula shows that the variance is positive and therefore a favorable variance. The actual sales (74,250) are greater than the budgeted sales (73,000) by 2,250. The total sales variance should equal the sum of the sales price and sales volume variances. The total sales variance is 2,250 the same as calculated above using the sales variance formula.